NEW YORK-- Vancouver Canucks center Henrik Sedin captured his first career Art Ross Trophy as National Hockey League scoring champion, Pittsburgh Penguins center Sidney Crosby and Tampa Bay Lightning center Steven Stamkos respectively each won his first Maurice Richard Trophy as the NHL goal-scoring leader, while New Jersey Devils goaltender Martin Brodeur collected his fifth career William Jennings Trophy as the goaltender for the club finishing the season having surrendered the fewest goals. 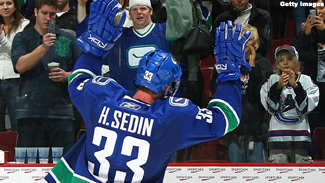 Sedin finished the 2009-10 regular season with a League-leading, career-high and Canucks franchise-record 112 points (29 goals, 83 assists) to edge Crosby (51-58--109) and Washington Capitals left wing Alex Ovechkin (50-59--109). Sedin becomes the first Canuck in franchise history and the ninth player in the past nine seasons to capture the Art Ross, joining Jaromir Jagr in 2001, Jarome Iginla in 2002, Peter Forsberg in 2003, Martin St. Louis in 2004, Joe Thornton in 2006, Sidney Crosby in 2007, Alex Ovechkin in 2008 and Evgeni Malkin in 2009. Sedin, Crosby and Ovechkin waged a neck-and-neck battle for the NHL points lead throughout the second half of the season, with Sedin regaining the lead by tallying four assists in a 7-3 win over the Calgary Flames in his season finale Saturday. Ovechkin, needing three points to overhaul Sedin in his season finale Sunday, was held without a point in a 4-3 shootout loss to the Boston Bruins. Hours later, Crosby nosed past Ovechkin into second place by tallying five points (two goals, three assists) in a 6-5 overtime win over the New York Islanders. Crosby's two goals today also were enough to earn his first career Maurice Richard Trophy. Entering the game third in the goal-scoring race, Crosby's 50th and 51st tallies of the season vaulted him past Ovechkin and, temporarily, Stamkos. Crosby, who reached the 50-goal mark for the first time in his NHL career, becomes the first Penguins player to reach the milestone since Jaromir Jagr posted 52 in 2000-01. Stamkos grabbed a share of the NHL goal-scoring title in the dying seconds of his sensational sophomore season today, matching Crosby's 51-goal total by scoring an empty-net goal at 19:47 of the third period that sealed a 3-1 win over the Florida Panthers. He had reached the 50-goal mark Saturday by scoring twice in a 4-3 shootout win over the Panthers. Stamkos, who turned 20 on Feb. 7, became the youngest 50-goal man since Los Angeles' Jimmy Carson in 1987-88 (19 years, eight months) and the third-youngest ever (Carson, Wayne Gretzky). He also is the youngest player to lead the NHL in goals since Columbus' Rick Nash (19 years, 10 months) joined Jarome Iginla and Ilya Kovalchuk in winning Maurice Richard Trophy honors in 2004. Brodeur appeared in 77 of New Jersey's 82 games this season -- the third time in the past four seasons he has played that many -- as the Devils finished with NHL's fewest goals against (191). Brodeur's five Jennings wins match the total of Hall of Fame goaltender Patrick Roy for the most among all goaltenders since the award was introduced in 1981-82. All three trophies will be presented at the 2010 NHL Awards, to be held in Las Vegas on Wednesday, June 23. The NHL Awards will be broadcast live from the Pearl Concert Theater inside the Palms Hotel Las Vegas on VERSUS in the United States and CBC in Canada.